Inscribed by Jimmy Durante ‘To Anne – a pleasure to know you – Jimmy Durante, Mar 30-42’. 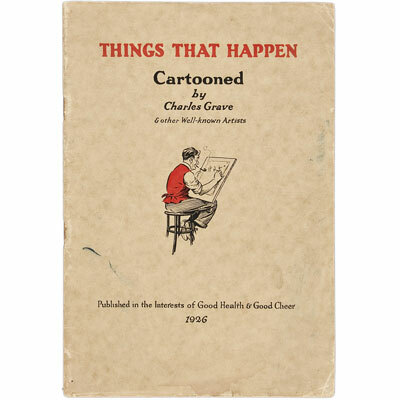 Illustrated with 16 photographs, illustrated title page and endpapers. The fabulous and rather risqué dust jacket was illustrated by Herbert Roese. A fine copy of this charmingly illustrated work from the great cocktail era, with original and classic recipes, including Pineapple Bronx, Dorothy Gish, East India, Havana, Gloom Chaser, Bunny's Hug, etc. A clean example of Farley’s popular work, illustrated with 13 copper-engraved plates including frontispiece portrait of John Farley and his establishment, and bills of fare for each month. With additional sections on ‘Culinary Poisons’, ‘Wines, Cordial Waters, and Malt Liquors’, ‘Necessary Articles for Seafaring Persons’, and ‘Proper Nourishment for the Sick’. Farley was principal cook at the London Tavern, and ‘contributed much to the popularity of the London Tavern as an eating house, an inn whose generous helpings attracted customers from far and wide‘. This work is in effect a combination of the two most popular cookbooks of the time written by Hannah Glasse and Elizabeth Raffald, with the small remainder taken from others. But will you wake for pity's sake! 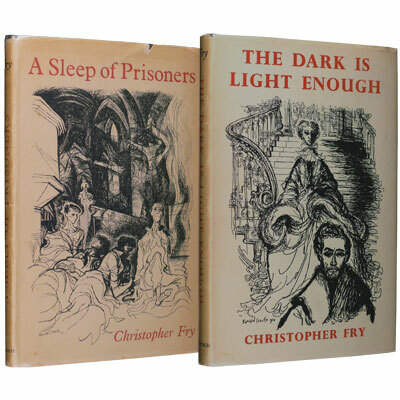 A highly imaginative, poignant drama about four prisoners of war locked up in a church in enemy territory, together with Fry’s 1954 play The Dark is Light Enough, his ‘winter comedy’ set during the nineteenth century Hungarian Revolution, and companion play to his earlier works The Lady’s Not for Burning, and Venus Observed. Two volumes in dust jackets illustrated by Ronald Searle. 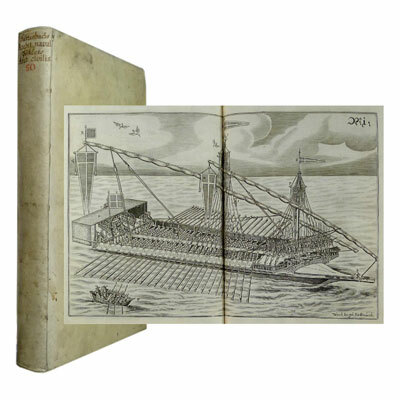 A stunning, clean and complete copy of Joseph Furttenbach’s famous treaty on shipbuilding, Architectura Navalis with double-page engraved title, title in red and black, twenty stunning double-page engraved plates showing boat design, and various types of boats many engaged in action with other boats and monsters of the sea. Furttenbach was a highly influential German architect, who attempted to cover all fields of architecture in his writings. Böckler corresponded with Furttenbach and his works on architecture were intended to contribute to the rebuilding of Germany after the devastation of the Thirty Years War, his Architectura Civilis, Nova & Antiqua presents a comparative treatment of the Orders [Architectural Styles] and is illustrated with forty engraved plates, woodcut printer’s device and red and black text to title page, woodcut head pieces, and initials. A finely bound early edition of this classic 18th century cookbook, which ‘revolutionised the way the British cook’. ‘She's the first domestic goddess, the queen of the dinner party and the most important cookery writer to know about. No, not Isabella Beeton; not Delia Smith nor Nigella Lawson, but an earlier incarnation of a kitchen trouble-shooter, Hannah Glasse’ - Rose Prince, The Independent (2006). ‘The Art of Cookery has a River Cafe Cookbook quality - in fact her excessive use of butter, which can have a lovely clear flavour, can be likened to the liberal dribbling of olive oil in Rogers' and Gray's recipes. The power of the book, though, is the clarity of the writing. She's authoritative but she is also intimate, treating you as an equal’ – Bee Wilson (food journalist and author). Signed by Goodman on the frontispiece portrait, a nice example in the scarce and rather delicate dust jacket. ‘”The Kingdom of Swing," written in collaboration with Irving Kolodin, might be called "From Rags to Riches." It's the narrative of a boy who learned to play clarinet in a synagogue music class for "maybe a quarter a lesson," and who has risen, by way of jazz, to an eminence where he earns maybe a quarter a note for playing the instrument as leader of one of the most famous of all dance bands. "The Kingdom of Swing" is a success story, but it's more than a chronicle of afflatus and affluence. It "sets" swing music in a clear perspective, explains it, gives out, as swingumbobs have it, with solid stuff about an important musical influence.’ – taken from a 1939 review by Robert A. Simon, music critic for The New Yorker. With five full page black and white photographic illustrations. 27 full page amusing advertisements and other cartoons for Worthington Beer. Covering many topics including golf, skiing, driving, football, swimming and rowing, and how they can be remedied with Worthington. Note this is the scarce original edition, in tanned illustrated wrappers, not the facsimile edition produced by Bass Brewery in 1977.